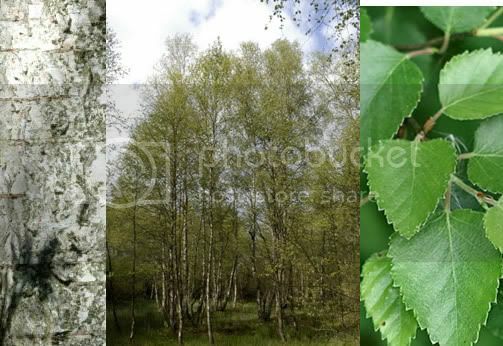 Betula pendula and Betula pubescens are the two birch trees native to this isle.
. Silver-Birch tree, bark and leaf, photo / pic / image. 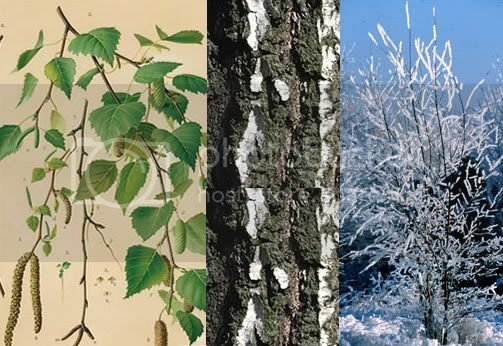 Betula pendula, the more upright of our native birch's, is also commonly known as Common birch, Weeping birch, European white birch, Lady of the woods, Lady birch, Betula verrucosa, Warty birch, Silver birch or white birch. These latter two common names are very appropriate for a tree whose trunk and arching branches are covered with greyish-white bark. Dazzling bark colour such as this is one of the main reasons that the silver birch has become a widely planted garden tree right throughout the country. Imagine a cluster of five silver birch, planted within a large heather bed which is lightly dusted with snow, a perfect winter scene and one which many avid gardeners long to recreate. Unlike other trees, which fade into the background once our leafless winter comes around, the elegant silver birch instead stands tall and like an Irish backpackers first day on Bondi beach, proudly displays its bright white chest and arms for all to see. A tree suitable for underplanting. Covering the delicate looking branches of the silver birch is its foliage, shimmering diamond shaped leaves toothed on their lower halves. The leaves of the birch are also good providers of seasonal colour, green for most of the year, with a welcome vibrant flush of yellow colour before shedding in late autumn. Because of the light and dispersed nature of these leaves, silver birch allows a fair quantity of filtered sunlight to brighten the ground beneath. This allows us to under plant the tree if desired (heathers anyone). The flower of the silver birch is a fairly nondescript catkin, this dangling cylindrical bloom is followed afterwards by winged seeds.
. Downey-Birch tree, bark and leaf, photo / pic / image. 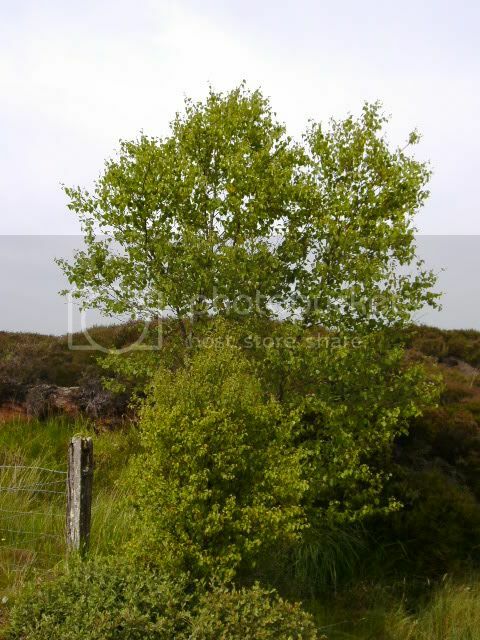 Betula pubescens (downy birch) is the second and more common of our native birches. This tree is very similar to the silver birch except that for a few telltale differences; firstly, its bark is instead a creamy brown in colour. Silver birch branches also tend to display a slightly pendulous habit compared to the more ascending branches of the downy birch. However, the most telling difference between the two is the fine downy fur that coats the new twigs of Betula pubescens, hence the common name. Although preferring a free draining soil, our birch's will grow quite happily in peaty or boggy soil. This is because they are shallow rooted; not being able to reach deep into the soil for moisture, so don't forget to water the tree deeply during dry weather. Another result of the tree being shallow rooted is its roots unfortunate ability to surface. It is seldom that the roots of these trees cause any major damage, if it does it is within close proximity to the tree, usually just lifting of patio slabs/tarmac or the cracking of greenhouse glass due to frame distortion. A typical safe distance to plant a birch tree from built objects is approx 10 metres (33ft), but please be aware that this is a guide only. On the exposure front, the birch is quite resistant to cold winds, which can often be found gusting across an open bog. That being said, its leaves will look much fresher and lustrous if the tree is planted in a sheltered location. Along with being beautiful garden trees, there is one more "green" reason I will offer you for planting a native birch. It is estimated that a single mature silver birch grown to 13 metres (40ft), can support up to 229 different species of insect, this is equivalent to a virtual city within a single tree. Betula pendula, growing information at a glance. Grows at a moderate rate. Main diseases are Leaf spot and Birch rust. 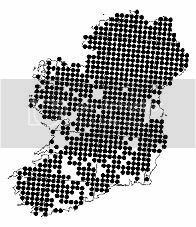 Chart shows approximate distribution of the Silver Birch tree within Ireland, each dot is a 10km square in which the species grows. 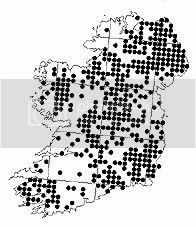 Chart shows approximate distribution of the Downey Birch tree within Ireland, each dot is a 10km square in which the species grows.
. A silver birch growing in an Irish bog, photo / pic / image. Other interesting facts about our birches. Birch wood is similar to in strength to beech wood. Recently it has become popular for use in furniture, kitchen and flooring manufacture. Although the birch wood used for this is usually imported. Video. Birch leaves coping with a windy day. Back to native Irish trees. somehow one of the birch trees in the garden had about the top 12 to 18 inches broken, on a tree somewhere between 12 and 15 foot tall. we have no clue about how it happened, given it should be quite supple (and the tree is looking perfectly healthy otherwise). any idea how it might affect the tree? i'm assuming it'll bush out a bit, but i don't know how much.